Really sorry I’m late this week guys. I promise to make it up to you this week. I’m working on a 2013 film in review post and will be writing an overview of what I think about this year in football. Mom had the bright idea of renting movies from Redbox the other day. The results were not promising. It was released as Hummingbird in the U.K. and Crazy Joe in France. 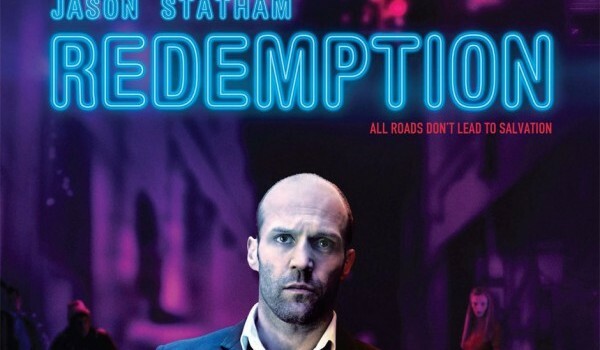 Action hero Jason Statham stars in Redemption. I like Jason Statham. He has a fun vibe surrounding him and I enjoy his stunt routines, something this film didn’t have enough of. Statham plays Joey Jones, a homeless ex-military man who…I honestly don’t even know. He’s traumatized from his experiences in Afghanistan and shows symptoms of PTSD, but we don’t learn anything more than that the entire movie. Statham’s character doesn’t reach any levels of depth. We know his life is bad and he’s in a lot of pain, but we don’t know much else. Joey’s mind is like a steel door and there’s simply no way to enter unless he opens the door, something the plot does not allow. Speaking of the plot, one wonders if this movie has one. This movie’s framework is held by flimsy popsicle sticks in its characters and its dialogue leaves little on the viewer’s plate. You don’t get a healthy sampling of anything in this script. Statham takes most of the screen time and there aren’t many other characters. Director and writer Steven Knight leaves Statham to carry the movie by himself with very few tools to use to aid him with this task, so few that it makes the task unachievable. At a running time of 93 minutes, this movie is far too long. My score for Redemption: 35. Knight appears unsure of what angle he wants his story to take, instead composing subplots and a needlework of misplaced character strings in the hopes that they become knit together at the end or that one of them pans out into something productive. Instead of one unified story line, this movie become a story spiderweb and the audience is unsure of which line they’re supposed to follow. Agata Buzek plays the nun Cristina and there are some questions I have. She has a confessional with Joey and says that she used to take gymnastics as a kid. She was raped by her instructor a number of times until she slit his throat. She was traumatized, I get that, but that takes some guts. How did she get away with that by the way? She did him like a cold-blooded killer. Wouldn’t there have been an investigation or something? How did she become a nun? I believe if you truly repent for your sins then you can be forgiven, no matter what you did, but I had a difficult time picturing this. Has she been pretending to be a nun this whole time just to get away from the world? Also, they keep showing us views from a drone. Are drones allowed to fly freely over London? Why are there drones following Joey? It was annoying because it’s not like you can see much up there. Serendipity is a romantic comedy starring Kate Beckinsale and John Cusack. The word serendipity, for those who don’t know its meaning, is the occurrence and development of events by chance in a happy or beneficial way. Jonathan (guess who) and Sara run into each other during Christmas shopping and both reach for a pair of gloves at the same time. Even though they are both in relationships they go to a nearby restaurant and have ice cream. Jonathan asks for Sara’s number, but she says no and leaves in a taxi. Jonathan then returns to the restaurant as does Sara because they both forgot something. This time they decide to go ice skating and Jonathan finally gets her to exchange phone numbers, but at the same time not really. Sara has Jonathan write his name and phone number on a $5 bill, which she then spends, while she writes hers in the cover of a copy of Love in the Time of Cholera. She believes that if it’s meant to be, then the $5 bill will circulate back to her and Jonathan will find the copy of Love in the Time of Cholera and they will find each other again. Personally, I think just saying you’re not interested would have sufficed. Jonathan, like myself, doesn’t like this, so they go into different elevators in a hotel, each carrying a glove from the pair they bought earlier, to see if they both pick the same floor in a hotel with 28 floors. Somehow they both pick 23, even though the probability of that is minute. Then an obnoxious kid jumps onto Jonathan’s elevator and pushes all the buttons. That compounded with more people getting on his elevator slows him down a lot and Sara gives up and gets on an elevator going down seconds before Jon comes out. A couple of years later…wait, what? None of this would have happened in the first place if Sara would have just given him her phone number like a normal person or if that stupid kid wouldn’t have pushed every button on the elevator or if John would have gotten on another elevator and just told her what had happened. Why is every little thing that happens to Sara fate? I’m guessing if she gets robbed she doesn’t call the cops because fate must have wanted it to happen right? Sara expects everything in her life to go according to plan and if it doesn’t then it gets categorized as a fate occurrence. That’s dumb and makes her cuckoo for Cocoa Puffs in my eyes. The time jump reveals that Jonathan and Sara are engaged to different people but are still thinking about each other because of “random occurrences”, like waitresses named Sara, etc. Why would you get engaged to someone you aren’t 100% in love with, especially when you know that you’re constantly thinking about someone else? It’s irresponsible and it turns their potential spouses’ lives upside down. You would think they would say “I’m just not that into you” or “I’m sorry, but I’m constantly thinking about someone else so I think it’s better if we go our separate ways” or something, but I guess that was too much of an effort. I’m already disgusted with the characters and I’m only a half hour in. If you’ve been following my blog a while, you probably know my strong disdain for John Cusack. The guy is bland, emotionless and uneventful. He doesn’t do anything exceptional. He’s like a logical processor, so I don’t know why he’s not cast in a robot role or something. In Serendipity, Cusack shows some emotion and even goes so far as to display facial expressions. However, he’s got no brain on him. Everything Jonathan does is guided by his emotions and he never seems to think about anything logically. Instead, actor Jeremy Piven steals the spotlight as Dean Kansky, Jonathan’s best friend. He’s exuberant, brimming with personality, and his humor is addictive. He’s like Jonathan’s living and breathing conscious in the flesh. Had there been more of him, maybe this movie wouldn’t have been so bad. Kate Beckinsale’s characterization is lackluster and borders divergence. Her internal compass is pointing in too many directions, making her character convoluted. My score for Serendipity: 43. This movie’s plot is far too convenient for its abstract characters, leaving it a casserole of unrealistic events, subplots, unnecessary complexity, plot twists every which way, and John Cusack. The only thing keeping me interested was seeing what obnoxious “fate occurrence” they were going to throw in next, and trust me when I say it barely avoided a suckage label. 1) He finds the shopping bag with the glove from that night under his bed a few years after that night. He nor his fiance ever cleaned his bedroom once in all the time they had been there? I’m sorry but whenever I a)start cleaning my room or b) lose something, under my bed is one of the first places I look. The receipt is in the bag by the way with the credit card numbers that she used to purchase it. You think he would have had the brains to look in the bag the second he got home. 2) He bribes a sale associate to give him the address to the credit card account and while acquiring it is allowed into an employees-only warehouse to get it by this same associate. 3) They visit her old apartment and get the artist who used to room with her to give them the address of the placement company which is right next to Serendipity. Who would have thought? Then they find out it has moved and its previous location next to Serendipity is now a bridal shop, something that Jonathan takes as a sign he is supposed to get married to his fiance, Halley (Bridget Moynahan). Wasn’t it fate that caused you to find that shopping bag in the first place? Does fate give contradictory messages? Is fate allowed to change its mind? 4) Sara takes her best friend, Eve (Molly Shannon, who I find obnoxious) to New York with her hoping that she will find Jonathan. They visit the hotel and Eve runs into Halley and it just so happens that they’re old friends. Who would have guessed? 5) The night before their wedding, Halley gives Jonathan a wedding present, a copy of Love in the Time of Cholera, and it’s the same copy that Sara had written in. Now Jonathan thinks it’s a sign to get back with Sara. Fate sure is indecisive. 6) Once they get each other phone numbers, they both go about getting each other’s addresses instead of just calling the phone number they just found! Why wouldn’t you just call the number?! 7) Sara’s on the plane to head back home and she pays for a drink with a $5 bill that she realizes is the one Jonathan wrote on earlier. How convenient! 8) Jonathan calls off his wedding at the last second. Hard to root for a guy who does that. There are plenty more convenient scenarios but those are the main ones. Sorry I’m late this week guys. The Steelers dismantled Cincinnati at home this past Sunday 30-20, but Steelers’ fans should not get overexcited. Cincinnati has never played well in Pittsburgh. Next they play in Lambeau and I’m going to take yet another leap of faith and take the Steelers against the Rodgers-less Packers. Both teams are fighting to stay atop the division but I’m going to take the Eagles at home. Director Ronald Neame made Charles Dickens’ Christmas classic, A Christmas Carol, into a musical film combo in 1970. I am not a fan of musicals because they are surrounded by weak characters and limited character advancement. Neame does not make the same errors, instead heeding to Dickens’ material and guiding the cast in a direction that forms a convincing atmosphere and memorable tale. A film that garnered Academy Award nominations for costume design and Best Art Direction, Scrooge transports its audience back in time through detailed sets that come across as very authentic. The cast itself is led by Albert Finney as Scrooge, who won an award for Best Motion Picture Actor in a Musical/Comedy. Finney’s representation is accurate and creative in its own sense. The audience’s understanding of his character is thorough entering the film, causing the need for an original performance from him to be all the more important. Finney rises to the task, never leaving the audience bored even though they have met the character countless times. The supporting cast is not overshadowed by the musical score, another blunder common in musicals but avoided here. A commendable secondary role by David Collings as Bob Cratchit was especially memorable for me. The musical score is catchy and complements the mood of the story well. It’s not song after song, but rather song, significant plot building, song. My score for Scrooge: 91. Neame turns a Christmas classic into an enjoyable musical film experience, one that should be viewed every Christmas season. It also highlights the key messages of A Christmas Carol, one of those being faith in the human spirit. Nothing to spoil. Sorry guys. 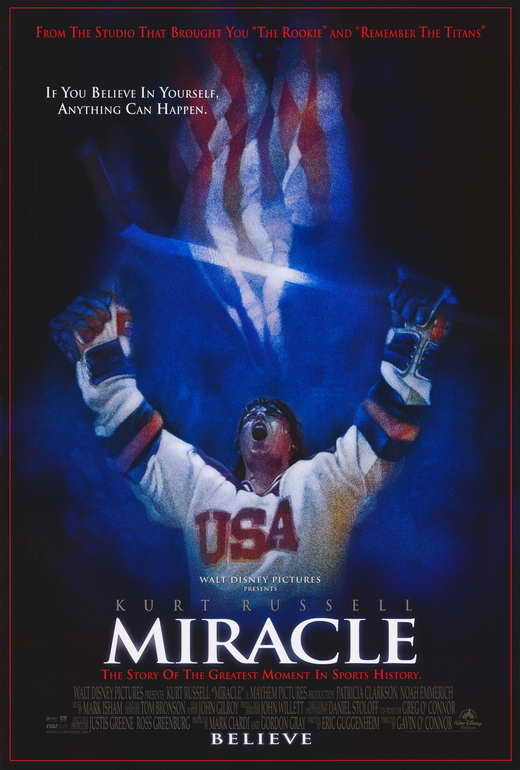 The story of the Miracle on Ice is displayed in Walt Disney’s Miracle, starring Kurt Russell as Herb Brooks. The plot focuses on the making of the team all the way up to the big game. That’s all I’m willing to tell you. You’ll have to see it yourself, as well you should. Kurt Russell is phenomenal as Brooks, easily the best performance of his career. He embraces the character and shadow of the famous hockey coach and never wavers from it, bringing in new depths of character in each scene. You get to know him more as the movie develops and learn to appreciate his tough love mentality. His intensity and internal fire are emblazoned into the hearts of the audience throughout, making you feel like you were there for the ride. How Russell wasn’t nominated for a Best Actor award, I have no idea because he certainly deserved it. The supporting cast is the perfect example of what a supporting cast is supposed to be: one that features numerous characters, all of which share the spotlight equally while allowing the audience to get to know each one. The supporting cast is a team effort and these cast members make it work, bringing it to a whole new level. If there was anywhere this movie could have gone wrong, it was in the game action, but director Gavin O’Connor hired real hockey players and brought them to acting, believing that would be easier than teaching actors to play hockey. This is probably true, but first-time actors are usually atrocious. With great coaching from O’Connor, these hockey players turned into solid supporting cast members, ones that were able to get us to care about them, ones that went above just doing the basics. The hockey scenes are exhilarating, enticing, and most of all, motivational. People say sports are just games, but sports can be more than that. The Miracle on Ice was not just a hockey miracle, but an act of excellence, of battling the odds and winning. It was a sign that the U.S. still had something to believe in. At a time in history when many believed the next five years would be worse than the past five years, tough times were a present danger for all. The U.S. morale had been beaten and wounded to an extent that many thought they would not recover from. The Miracle on Ice showed the nation, at a time when it was most vulnerable, to believe. This movie reminds us of that, that we may never forget to believe in not just life, but in ourselves. My score for Miracle: 97. Easily the best sports movie I’ve ever seen, Miracle is a story of the human will, one that establishes an emotional and physical attachment to the audience that makes the audience feel like they were actually there for it. The musical score molds well with the story, the acting is far above average, and the hockey itself, engaging. If you don’t feel anything after watching this movie, you probably have no soul. Nothing to spoil, nor would I. This movie is far too good to ruin. A quick sidenote: I have been thinking about some of my previous reviews and have realized that I’ve been a little too lenient on the grading, so expect some more “reasonable” reviews. I changed three scores: The Hobbit to a 75, and the two Hunger Games reviews got bumped down a point. Just thought I’d let you guys know. The Hobbit: The Desolation of Smaug was a movie I was not looking forward to. The first one was such a disappointment and such a waste of time that I was ready to give up on the Hobbit trilogy then and there. However, the trailers for this one looked a lot better. I also figured I might as well finish what I started and just write reviews on the whole trilogy so you’re all welcome. Martin Freeman returns as Bilbo Baggins and this one was centralized on him like the first one should have been. If you recall, I thought one of the major flaws of the first one was that Thorin played more of a lead role than our main character did, stealing the spotlight away from the story we were supposed to be hearing. It wasn’t a slight to Thorin’s character or actor Richard Armitage. He did a good job and I acknowledge that. I feel the blame fell more on the writers’ shoulders because they failed to make any real character connection with Bilbo nor did they really give Martin Freeman the opportunity to prove himself as an actor. This one does not make the same mistake a second time, broadening Bilbo’s character and making us appreciate him as a person as well as getting to know who he is. He’s timid and yet has a courageous side that the audience can rally behind. Despite the improvements on Bilbo’s character, I still find it lacking in some areas. I know him better than I did in the first one but I still have unanswered questions regarding his character. One of the big ones: what is causing him to continue to go forward on this journey? I know at the beginning he talks about wanting to go on an adventure and I get that. A lot of people today want to go on an adventure and have a day like no other. A day where they can do something heroic and do it for the right reasons, or a day where they can step up to something they know is wrong and do something about it. However, despite an everyday person’s want to do something like this, most people have these opportunities pass them by, because things hold them back, whether it’s fear, judgment or something else entirely. The person who has a chance to make a difference meets obstacles and rarely are they willing to make the leap of faith to get over them in order to get a chance to make that difference. They would rather that chance just jump in their lap and make it an easy ordeal, but that’s not how life works. That’s why whenever someone does a selfless act they are so highly praised for it because not only did they talk the talk, but they walked the walk. I want to feel the same way for Bilbo, except that I’m not convinced of his motive. He’s had many chances to turn back. Why hasn’t he? I feel like that question hasn’t been answered yet. Perhaps the writers are saving that answer for the big finale but I feel it causes the current product to falter. Thorin plays a good secondary role once again and while I still don’t know most of the dwarfs’ names, I feel like I know the niche they are supposed to fill. The action series reached a new intensity and dynamic in this one, another element that was lacking in the first. Of course, when you have Legolas and the Wood Elves showing off incredible archery skills, it’s hard to not be entertained. Among some of the mishaps in this film, Gandalf leaves the fellowship within the first half hour in order to perform an individual endeavor that also seems to lack any logical output, something I’ll discuss in the spoiler’s edition. The conclusion is acceptable if not predetermined. I feel everyone saw the ending coming from leagues away. My score for The Hobbit: The Desolation of Smaug: 84. A large improvement from where it started, The Hobbit: The Desolation of Smaug makes appropriate strides of improvement for a sequel, but it still lacks some and leaves the audience wanting more. There are still portions of this movie that could have been cut and at times, it’s still obvious that Jackson is drawing this story out a lot more than it needs to be. Why there was an insistence to make a 300-page book into a trio of three-hour movies when the Lord of the Rings made a trio based on three 400-page books, I don’t know. It doesn’t make sense, especially when I could probably read through a 300-page book in half the time it takes to watch nine hours of film, if not less. 1. The film starts with Thorin going to the Prancing Pony in Bree a year before the journey ever started. Gandalf meets him there, tells him someone’s trying to have him killed and oh, by the way, it’s time to obtain the Arkenstone. 2. It then shoots to present time showing Gandalf and the dwarves evading Azog and the Orc party, eventually coming to the house of Beorn for shelter, staying one night and taking his horses in the morning, meaning the only need-to-know point of that whole encounter was to get horses so they can run across a valley and get to a dark forest and Gandalf can skip out on them. Why couldn’t we just start at the forest shortly before Gandalf leaves them and just narrate “shortly after borrowing horses from a friend”? 3. Why is Gandalf abandoning the group? So he can obey a telepathic message from Lady Galadriel and investigate the tombs of the Nazgul. That makes sense but what if they all just broke out and then Gandalf arrives? Gandalf can’t fight all nine at once. Why couldn’t they send someone less important, like the Brown wizard or a talking bird or something? After finding all the Nazgul are gone, Gandalf goes to Dol Guldur and before entering says he “knows it’s a trap”. If you know it’s a trap then why are you going in? I know you’re really powerful and all, but once again, is there someone less important we can send instead or better yet, more people we can send to back you up, like a nine-man team or something, so the mission has at least a small chance of success? It doesn’t help that you know the size of the Orc army when you’re locked in a cage, forced to watch as they go to kill all your friends. Questionable decisions there, Gandalf. How does Smaug fail to kill any of the dwarves in their whole skirmish in the mountain? He’s huge and can breathe fire and the dwarves are fat and slow. He also seems to be dumb because he manages to light the forges for the dwarves, the forges being the only formidable weapon that the dwarves had against Smaug and then he stupidly walks up to a statue of molten lava. I don’t mean to be insensitive, but I’m pretty sure at least one party member would have died in all that mess. Finally, Thorin and the dwarves look for the keyhole to the door to the mountain for all of five minutes before giving up. Really? You’ve traveled all this way to give up in five minutes? Why were Bilbo and I the only two people smart enough to wait and see if anything happened when the moon came out, since it’s called moonlight and would technically be the last light of the day? Then Bilbo calls for the dwarves to come back, no one responds, he looks for the key, kicks it and Thorin pops out of mid-air to pin the key to the edge of the cliff with his clan right behind him. What? No. That does not happen. Elf was made in 2003? Man that makes me feel old! The Christmas classic starring Will Ferrell and Zooey Deschanel was viewed by my family and I yesterday and once again I was reminded how much I love this movie. For those who haven’t seen it, how haven’t you? Buddy (Will Ferrell) sneaked in to Santa’s bag of toys and wound up at the North Pole. He’s raised as an elf and doesn’t discover he’s an elf until he’s well into his thirties! Then he learns that his real father works at the Empire State building in New York City and so begins Buddy’s journey. Will Ferrell was the perfect actor to play this character. Between Ferrell’s expertise in comedy and his hilarious facial expressions, I’m not sure anyone else could have played the role aside from maybe Jim Carrey. While he’s incredibly annoying, it never gets irritating, partially because it’s just too funny to get mad at. A great portrayal of Buddy’s father by James Caan as well as the rest of the supporting cast really helps give the script and Ferrell the solidarity it needed. You feel for Buddy, or at least I did. He’s a child stuck in the body of an adult, who still has that childlike innocence and naivety in his character. The movie is sentimental in its message: remembering what it was like to be a kid, to believe in things with absolute faith and not a single doubt in the world. You didn’t know all there was to life, just as Buddy doesn’t. You can see that when he puts syrup into spaghetti, eats gum off the subway railings, and runs ’round and round the turnstile doors. Despite how dumb it is, you can’t help but smile because it reminds you of the stupid things you used to do, presenting you with a sense of nostalgia. Couple that with the Christmas spirit and some dumb humor and you’ve got a Christmas hit. 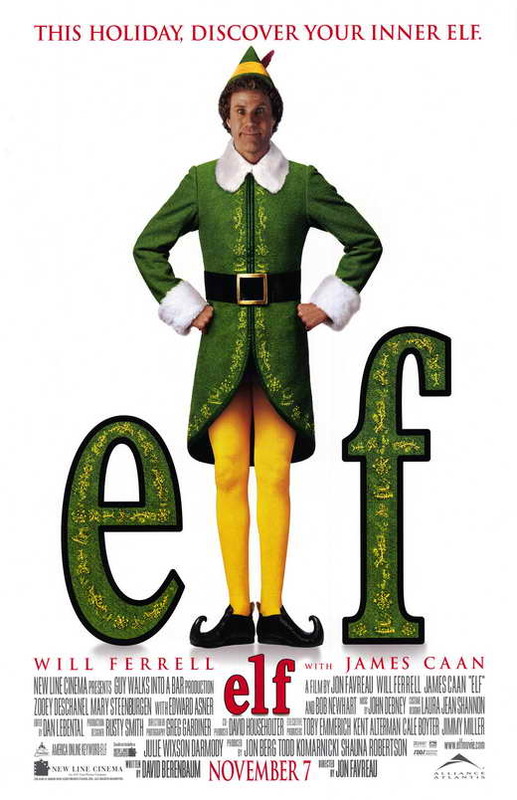 My score for Elf: 88. Filmmakers try to make a new holiday classic for the ages every year, and very few succeed in doing so. This one does just that. The only reason it doesn’t get a 90 is I find myself asking for more from the 97 minute running time. Just kidding guys. Nothing to spoil here. Stay tuned for my review of The Hobbit sequel. Prior to watching this, I had some intense biases against this movie. For starters, Andrew Garfield, the guy playing Spider-Man, is British, and I had a hard time imagining him pulling off a convincing Brooklyn accent. Second, our main villain is the Lizard, even though I would have preferred a Spider-Man movie to begin with the green goblin as it did in the original series with Tobey Maguire. Third, this Spider-Man makes gadgets that shoot the webs. It’s not a superpower in this one. While more true to the original comics, I preferred that it was a superpower. What’s cool about having to make gadgets that do that? Let’s throw some creativity in there and make it more interesting. Fourth and finally, we just watched the Spider-Man saga and now we’re starting over? Already? It like just happened. I try not to go into movies with biases but it was hard not to with this one. Something I’ve noticed with video games and movies featuring Spider-Man is that there are really two different Spider-Mans. There’ the one I like: the one who has had a crush on Mary Jane forever and displays admirable traits like loyalty, humility, intelligence. The one who is friends with Harry Osborn and has a close relationship with Uncle Ben and Aunt May. There’s the other one: he’s still picked on, but he’s cocky and has an attitude problem. He thinks he’s better than everyone else once he gets his powers and trash-talks/jokes around even when he’s in a serious situation. Harry Osborn nor Mary Jane are ever mentioned. Peter’s relationship with his grandparents is close to nonexistent, and we’ve already talked about how he has to make an invention for the web-shooting. The original trilogy with Tobey Maguire was with the first Spider-Man. This one features the latter. Andrew Garfield is portraying someone entirely different from who Maguire portrayed and it shows in the final product. I’m not saying I can’t feel for this Spider-Man. I’m just saying it’s harder for me to relate. I can’t really see myself being this Spider-Man, while the opposite is true of the previous Spider-Man. For the most part, Garfield’s acting isn’t bad, but it’s not spectacular. It’s got nothing on Maguire’s Spider-Man. The supporting cast isn’t bad, but once again, it’s nothing spectacular. The action scenes are involving and integrate the audience well, but I’m not thinking “cool” or “that’s awesome” every two seconds like I have in other superhero movies, like in the original trilogy. The movie gives Aunt May and Uncle Ben limited roles and act like they didn’t play a significant role in his life like in the previous movies. Sally Fields barely says anything the whole movie and Aunt May played such a prominent role before. It was an aspect I missed in this movie. My score for The Amazing Spider-Man: 80. This movie kept me entertained and I was interested to see what happened next, but it has nothing on the original trilogy. I’m not sure why they needed to make another Spider-Man so soon after the Maguire ones. I know the third one was unsatisfying, but I don’t see how that means you should just start all over. Peter Parker gets his powers and goes to school like always. Then he catches a basketball that Flash and a couple of his friends were playing with and he taunts Flash to take it. Flash can’t do it because of Peter’s fast reflexes and that the ball is sticking to Peter’s hand. Then he drives past Flash with the ball and dunks, breaking the backboard. What? Peter Parker doesn’t do crap like that. That’s not who he is. He’s arrogant, cocky, and self-centered, and that’s not who Peter Parker is supposed to be in my mind. Later, he taunts police officers and criminals. He also does so many stupid things that you have to wonder how no one knows he’s Spider-Man. Gwen Stacy and him are watching the football team practice and Peter catches an errand pass , and flings it back at the field goal post, denting the post on a throw that was at least 50 yards away. How does he get away with that? No one thought that was abnormal or better yet, thought he should have to pay for it? Then at the end, Gwen Stacy’s dad is dying and makes Peter promise that he will leave Gwen alone for the sake of her own safety. Peter doesn’t attend the funeral or help care for Gwen during her loss in any way. She stops by and asks him what’s up, and he says he can’t see her anymore. At the end of the movie, he’s at a lecture behind Gwen and the teacher says something about “don’t make promises you can’t keep”. Peter whispers into Gwen’s ear “but those are the best ones.” So you made a promise to a dead man and now you’re going to break it without even trying to keep it? Wow, that’s low, man. Heck, Peter didn’t even make a promise to anybody and he still stayed away from Mary Jane for a while because he didn’t want to put her in danger. Once again, Peter showing he only cares about himself and only cares about the romance he can have with Gwen now rather than keeping her safe. This Spider-Man is a jerk.